ForFarmers has developed a new piglet starter feed range in collaboration with Trouw Nutrition under the VIDA brand. The new brand range is aimed at piglets from day one through to the grower phase. ForFarmers will be launching VIDA in the Netherlands, Germany, the UK and Belgium, making it ForFarmers’ largest ever international product launch so far. VIDA is the result of the first joint collaboration between two leading specialists ForFarmers and Trouw Nutrition, a daughter company of Nutreco, ForFarmers strategic partner. 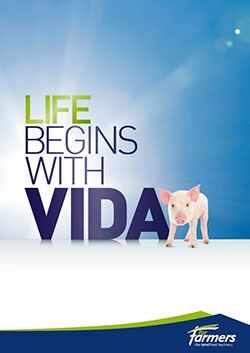 The new VIDA brand is 'powered by Milkiwean' one of the best known piglet starter feed brands in the World. The Milkiwean piglet feeding range from Trouw Nutrition is underpinned by World class scientific research, product application and know how. The unique collaboration between ForFarmers Nutrition Innovation Centre (NIC) and Trouw Nutrition's dedicated R&D assets offers a level of innovative nutritional power not seen before. "The partnership's knowledge of Raw Materials, specific production facilities, and the combined scientific research facilities, together with ForFarmers strong customer relationships, specialist advice and local expertise makes VIDA a unique and leading concept, delivering a lifetime of 'total piglet performance'" Yoram Knoop ForFarmers CEO explains. ForFarmers is targeting the number one spot as supplier of piglet starter feed to sow farmers in North West Europe with the introduction of VIDA, powered by Milkiwean. The main objective is to be able to provide every type of sow farm with piglet starter feed which will result in outstanding growth, health and efficiency. This in turn will provide the sow farmer with a demonstrably improved physical and financial performance. In short: a feed concept and product range which will fully meet any of the sow farmers’ current and future stringent requirements. 1. Ensuring VIDA is at the top of international research and practical knowledge, brought together by ForFarmers and Trouw Nutrition. 2. There are specialised product lines for the VIDA piglet starter feed range in each of the four countries within which VIDA is going to be launched. This will allow us to produce the purest and most digestible feed for young piglets on the market. 3. A sophisticated composition and preparation of Raw Materials. The new piglet starter feed range doesn’t contain ordinary soya, but ultra finely ground soya combined with other highly digestible ingredients. This unique approach will enable piglets to maximise dietary protein for growth purposes. 4. A team of specialists who are completely focussed on supporting customers with the feeding of their piglets and sows will be available in each country where the new piglet starter feed, VIDA is being introduced to support customers in harnessing the full potential of the VIDA range in their business. Together with the Milkiwean specialists, they have an in-depth knowledge of feeds and feed applications and will continually and accurately monitor major industry developments. VIDA Piglet Starter Feed, Powered by Milkiwean have been tested on over 26,000 piglets on more than 40 farms throughout North West Europe. In addition, the new products have been rigorously tested in Trouw Nutrition's research centres over the past six months. This extensive testing is unprecedented and underpins the outstanding results being achieved in test facilities but most importantly on commercial farms all over Northern Europe. Feed Intake levels are very impressive proving that the feeds are highly palatable, growth rates are outstanding and feed efficiency has been substantially improved. “We want to work in partnership with the sow farmer with both feed and technical advice which will offer them a comprehensive profitable nutritional solution for the challenges of modern pig production both now and in the future. You need to completely understand the industry in order to be able to do this, but you must also be fully up to date on the latest scientific insights. Trouw Nutrition is a global leader in scientific research into the effectiveness of piglet feed and has made significant investments in field trials and knowledge regarding the appropriate feed applications. ForFarmers has also committed a great deal of effort to research and innovation and has in-depth knowledge of the industry and the issues arising on farms as a result of the close involvement the specialists have with customers’ operations. The strategic partnership with Trouw Nutrition allows us to bring together the very best scientific and practical knowledge and both companies possess the very best production experts. We have therefore put all our efforts into the development of the latest and best in piglet feed. The result is our new VIDA brand." Richard Maatman, Trouw Nutrition’s Global Marketing Director: “More added value for pig farmers”. "We have, as a result of our strategic partnership with ForFarmers, created the new VIDA concept and brand range of Piglet starter feeds which brings to the market a level of nutritional innovation never seen before. By combining Trouw Nutrition's expertise and knowledge of R and D in Piglet Feeding with ForFarmers R and D from their Nutrition Innovation Centre (NIC) we have created a 'knowledge pool' that is both unique and unprecedented in the animal feed industry. This access to experience and knowledge of R and D in the field of young Piglet starter feeding coupled with ForFarmers specialist advice on farm is highly complementary and synergistic. The result is the Piglet starter feed concept and brand range VIDA which will lead to a significantly improved enterprise result."